The longest night. A vampire’s delight. The winter solstice, a time of birth and rebirth, life and death, waning light and rising darkness. A time when those who flee the sun and crave the taste of blood find their greatest solace. But one never knows what the longest night might hold. 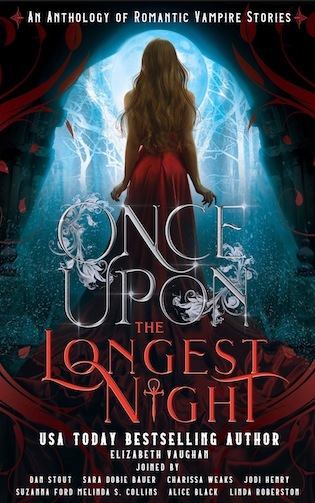 Once Upon the Longest Night, a collection of adult paranormal romances, features eight novelettes of lovers and their battles against one of the greatest legends of our time: the vampire. A 15th-century seaman and the love of his life come face to face with a vengeful manjasang. In ancient Rome, a hunted priestess captured by a loyal centurion offers her aid to the enemy. With the help of a handsome Royal courier, a reluctant Romanian princess braves the curse flowing within her noble blood. Danger awaits when a vampire in the far reaches of North Dakota must endure the lethal cold to protect the woman she loves. And in a future New York, a broken general returns home for the Longest Night Ball where he meets a young male witch who might change his life forever. Suffering from PTSD, vampire general Devlin Frost returns home from the war on Lycans and attends the historic Longest Night Ball. Here, royal witch Elijah Crow must choose three immortal suitors to compete for his love and power. When Devlin is shockingly chosen as one of the three, his immediate attraction to the young witch coaxes him into entering the fray, but this battle is for more than Elijah’s love. The broken general might also win back his ruined heart and bruised soul—if he survives the night. Everyone knew Westwyck Coven threw the best Longest Night Ball. Devlin had been there before, six years prior, before heading off on another successful tour to battle the Lycans in Africa. Ever since they’d butchered all the humans on that continent, the werewolves had been trying to invade upon the rest of the world. He’d only been home for a matter of weeks and had yet to remember how to be normal, although “normal” was difficult to quantify within the bounds of fae high society. As a soldier, the aristocracy frustrated Devlin. He’d spent hundreds of years fighting bloody battles with wolves, yet it was the wealthy that scared him most—with their passive-aggressive posturing and sickly sweet smiles. At least werewolves came at him with teeth bared. Now that he was back in New York, it was impossible to know who wanted to be a friend and who wanted him dead. And, there was the matter of the posadh. Some royal witch had apparently just turned eighteen, and as per custom, she was forced to choose three possible vampire mates to compete over her for the duration of December twenty-first’s darkest hours. Deflowering a virgin witch gave vampires increased power—whether that be physical, influential, or financial. That power could last upward of one hundred years, so competition was famously fierce. At least one of the three “suitors” usually ended up dead. It was a disgusting business but part of fae high society. The union benefited vampires, but it also granted witches a vampire’s immortality, ensuring the secrets of magic lived on and on, all part of the treaty’s give and take. Devlin wanted nothing to do with it. Already, he missed the war. To rectify his unease, he had wandered away from the grand ballroom an hour before. He now perused the quiet back hallways of Westwyck Estate, far from the sound of an impressive all-witch orchestra that played Christmas carols arranged as waltzes and tangos. He sipped a rich mixture of blood and sweet red wine from a crystal goblet as he strolled, taking in the mansion’s interior. In homage to ancient tradition, electric lights had been dimmed for the night, replaced by tall, gilded torches standing at intervals down the endless hall. Their dancing flames cast flickering shadows on the walls, creating what he assumed should be a sensual mood. Instead, he thought of battles long past, bloody fangs in firelight. As opposed to terror, the memory afforded perspective. He would much rather have been at a twilight fight than surrounded by the cultural complexities of a fancy ball. On the walls, papered in forest green, hung massive portraits of Westwyck witches who’d come before—men and women who’d probably died long before the treaty. For all he knew, vampires had killed some of them. Magic and blood fae hadn’t always been buddy-buddy. He was leaning forward, almost nose-to-nose with the painting of an ugly witch named Galahad, when a hidden door sprang open to his right. A blood-soaked Lycan lunged with jaws wide. Devlin vaguely heard his wine glass shatter. He punched the monster once in its gaping jaw, twice beneath its hairy ribs, then unleashed his own fangs, prepared to tear the monster’s throat. But a bright green light flashed through the hall, momentarily blinding him. He didn’t notice the pain until his back slammed against a wall, and he melted to the floor. He curled in on himself, moaning. He hadn’t been hit by a spell like that in… Never. He had never felt such power in his long, long life. He tried to stand, ready to fight more and more—fight forever if he had to—but a tall, dark shape pointed a glowing finger in his face. He blinked and tried to swallow around the lingering pain rising from his gut. He tasted blood, but at least pain allowed a little clarity. Devlin sought his werewolf adversary but saw nothing more than a heavyset thug with a bloody nose, groaning on the floor ten feet away. And the phantom wasn’t a phantom at all but a man. Though young, he held the bearing of someone who knew how to own a room. Despite being thin and in possession of such delicate features as to appear feminine, he held his shoulders up and back, his chin high—like a soldier bracing for battle. In an all-black suit, the witch was all the more ominous due to his glowing green pointer finger, still directed at Devlin’s nose. “I’m sorry.” Devlin pressed the heel of his hand to his throbbing temple. “I thought…” The words solidified in his throat. War had followed him home. After his last tour—when he’d started seeing imaginary enemies everywhere—he’d been forcibly sent home to New York. The doctors said the delusions would stop once away from combat. They said to give it time. Get married. Get settled. Find happiness. But what did doctors know about being a soldier? The injured “bodyguard” swore and shoved to his feet before disappearing through the door hidden in the wall, leaving Devlin alone with the witch. Hand no longer glowing, he reached up to touch the long scar on Devlin’s cheek. Devlin caught his wrist and squeezed, feeling a powerful pulse radiating into his palm. It tempted him far more than it should have. “Don’t be rude,” he said. The witch smiled, and Devlin instantly read the question glittering in his eyes: Or what? Devlin still held the witch’s hand. He couldn’t seem to let go—or, perhaps, he didn’t want to. 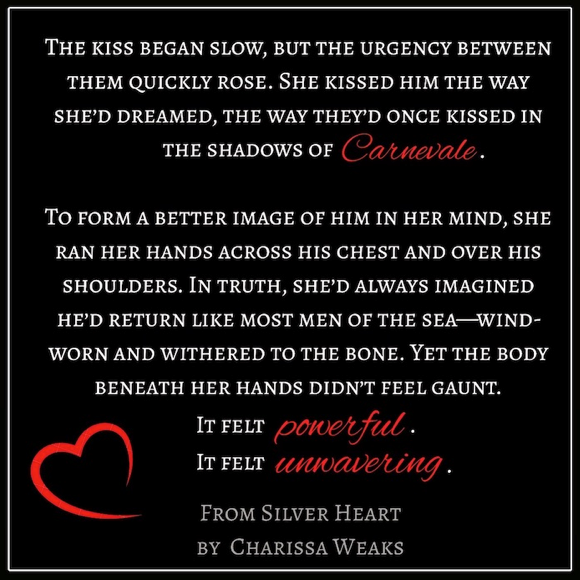 He swallowed hard, realizing how long it had been since he’d stood close enough to smell desire in someone’s blood. He smelled it now. “Only six years,” he said. Devlin couldn’t keep from studying the witch more closely. He had the tender skin of innocent youth, the unbridled passion of a boy on the cusp of manhood, and the eyes of a fearless soul. It was almost too much. Too tantalizing. The witch touched his wrist where Devlin’s grip had been, as though he’d felt the heat between them, too. On an exhale, he pushed black curls behind his ear and stared at Devlin, who found such scrutiny unnerving. He would have sworn the witch saw straight to the depths of his dead, empty heart. Based on Devlin’s reputation, the witch should have been scared; instead, he tilted forward, closer. He was recklessly confident for a man his age. But more than that, this magic fae carried something akin to fire beneath his skin. And Devlin wanted to be burned.